If you ask a random group of people about the Maasai you would very likely get starkly different responses. The older generation would in all probability identify the Maasai as the proud warrior tribe found in Kenya and Tanzania who are known for their trademark red-checked shuka (blanket-like cloth), fine beadwork and their joyous dancing. Younger persons would in all innocence say sneakers, scarves, towels, luxury vehicles, swimsuits, dresses and moccasins. 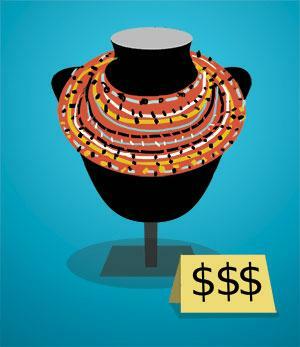 According to a specialist advocacy group, Light Years IP of Washington, DC, more than 1,000 companies, among them the high priests of fashion, such as Louis Vuitton, Calvin Klein and Ralph Lauren, apart from iconic car manufacturers such as Jaguar Land Rover, have used Maasai imagery or iconography to sell their brands. Some of these companies have even patented their Maasai brands. The style and name of this East African tribe is so widely imitated that, Ron Layton, head of Light Years IP, which works on public interest intellectual property (IP) issues, estimates the value of the “Maasai brand” at more than US $10 million a year. There are two million Maasai in East Africa and nearly 80 per cent of them live in poverty. Since the Maasai do not get any compensation from the global brands which have used their name and cultural iconography to sell billions of dollars worth of goods over the decades, Isaac Ole Tialolo, a Maasai, teamed up with Layton to set up the Maasai Intellectual Property Initiative (MIPI) to protect the tribe’s interests flowing from its cultural heritage. Founded four years ago, MIPI has been asking companies not to use the name Maasai or copy the Maasai style without a licensing agreement. Layton was roped in because one of his companies, Position Business, had helped Ethiopian coffee growers to build a global trade for their premium coffee. Royalty claims by the Maasai are worth hundreds of millions of dollars, according to Layton, who believes the tribe could earn substantial money by getting companies to agree to part with a percentage of the retail value of their goods as royalty. Although cultural motifs are not covered by formal IP rights, the founders of MIPI hope that they can persuade companies across the board to fall in line. The first success came in February when MIPI struck a deal with Koy Clothing for 5 per cent royalty payments on the proceeds of its Maasai-inspired line. A report in World Trademark Review quotes Layton as saying that he hopes the agreement, though not based on any formal IP rights, would encourage larger fashion houses, such as Louis Vuitton, to transfer their Maasai-related trademarks to MIPI and pay a license fee for use of its brand. The deal has given MIPI confidence in the morality of its demand since it was quoted as saying that it expects nothing less than 5 per cent royalty. “Just because the Maasai are a tribe doesn’t mean that they will accept less than the market rate,” says Layton. If only such outcomes were possible in India. The rich cultural heritage of its tribesfolk has been coolly appropriated by commercial entities without so much as an acknowledgement. The biggest thievery has been by Hindi commercial cinema (Bollywood) which has taken folk music lock, stock and barrel and minted crores of rupees without sharing the benefits with the original musicians, such as the Manganyars of Rajasthan. Some years ago, the Warli tribe of Maharashtra got IP protection for their art, a distinctive linear depiction of human figures with high use of triangular shapes. Sought by Ayush, or Adivasi Yuva Shakti, based in Thane district, a GI or geographical indication trademark was given to the non-profit. Ayush had hoped it would benefit the tribe. While Warli drawings are hugely popular now, used in everything from pottery to clothing, no money has ever gone to the Warlis themselves. (This column was first published in the 1-15th March issue of Down To Earth under the headline 'Protecting a tribe's band').